The only way king cake could get any better is to mini the sucker. I feel that way about a lot of foods, but especially the sweet ones. These Mini Vegan King Cakes may look a little tedious to make, but they're actually pretty simple thanks to vegan canned cinnamon rolls. I know! 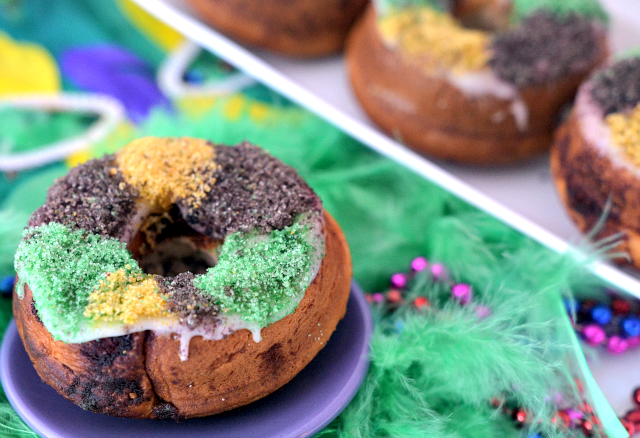 So unlike regularly made full-sized king cakes, these are only halfway tedious. 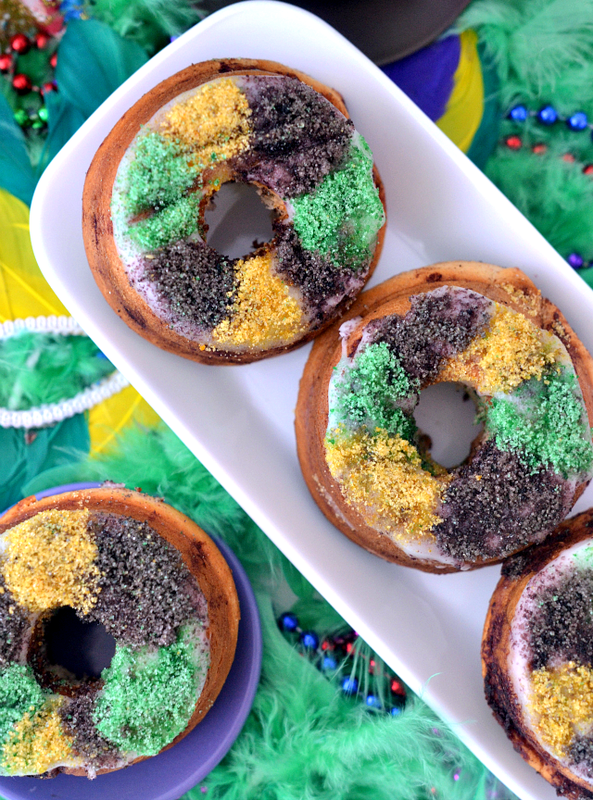 Every year around Mardi Gras time I really want to eat King Cake, but I almost never want to make it. While it's not hard to do I usually just don't feel like kneading things. That's what happened to me last week when the cravings started to hit. In lazy desperation I started thinking about ways to fake it. My King Cake recipe tastes a lot like cinnamon rolls, and the moment I remembered that I got an idea. 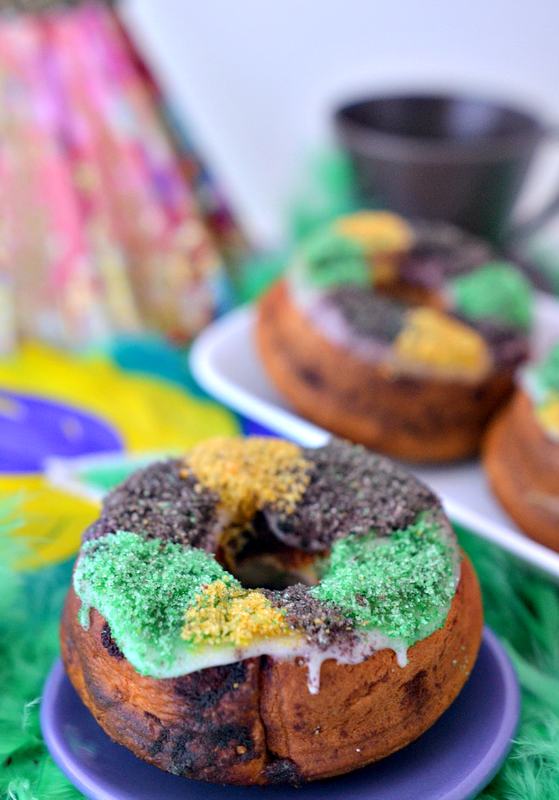 Why not use Immaculate Baking Company Cinnamon Rolls or Trader Joe's Jumbo Cinnamon Rolls to make mini king cakes? It's such a great cheat! The cans even come with their own icing to cut down on labor. Which is good because for a cheat recipe there's definitely still some labor. The process isn't hard at all, but it's a little clunky. I used my donut pan to bake the mini cakes, but that didn't produce a perfect hole in the middle. More like an indention. The cinnamon rolls are larger than the donut pan cavities so they bake over the middle portion. No big deal though because the indention serves as a handy guide for you to cut out your own middle. This was a first time effort y'all, but the cut out solution was actually very simple and clean. For the colored sugar, I made my own using granulated sugar and food coloring. You can find great vegetarian food coloring out there, or you can even make your own. A quick google search will point you in the right direction depending on the type of coloring you'd prefer. 1. Line a baking sheet with parchment paper, and set it aside. Evenly divide the sugar between three bowls (1/3 cup sugar per bowl). 2. Add a few drops of purple (or red and blue mixed) food coloring to the first bowl of sugar, and use a fork to thoroughly incorporate the coloring into the sugar. Add more coloring if needed to get the shade of purple that you want. Repeat this step with the yellow food coloring in another bowl of sugar, and the green food coloring in the remaining bowl of sugar. You should have a bowl of purple sugar, a bowl of yellow sugar, and a bowl of green sugar when you're done. 3. Carefully transfer the purple sugar onto 1/3 of the prepared baking sheet. Transfer the yellow sugar to the middle of the baking sheet, and the green sugar to the last third. Spread the sugars out a bit, but make sure to keep them separated by at least a few inches. Allow the sugars to dry out for a bit while you prepare your cakes. 4. Preheat the oven to 350°F, and spray a 12-cavity donut pan with a little bit of oil spray. Open the first can of cinnamon rolls, and put the icing aside for later. 5. Take one cinnamon roll and carefully unroll it. Sprinkle the unrolled dough with a good heavy pinch of pecans, and then re-roll it leaving a 1 inch hole in the middle. Place the roll into one of the donut pan cavities. Repeat this process with the remaining cinnamon rolls. Place the rolls in the oven to bake for 13-15 minutes, or until evenly browned. 6. When the cinnamon rolls are done carefully transfer them to a cooling rack, and let them sit until they're completely cool. Meanwhile, open the icing packets and squeeze the icing into a small mixing bowl. 7. When the cinnamon rolls are totally cool it's time to turn them into mini king cakes: Take a roll and use a paring knife to carefully cut out the hole in the middle using the indention as your guide. Dip the top of that roll into the icing and shake off any excess. Use a small spoon to spoon a little bit of each color of sugar onto the iced part of the roll - alternating between the colors. 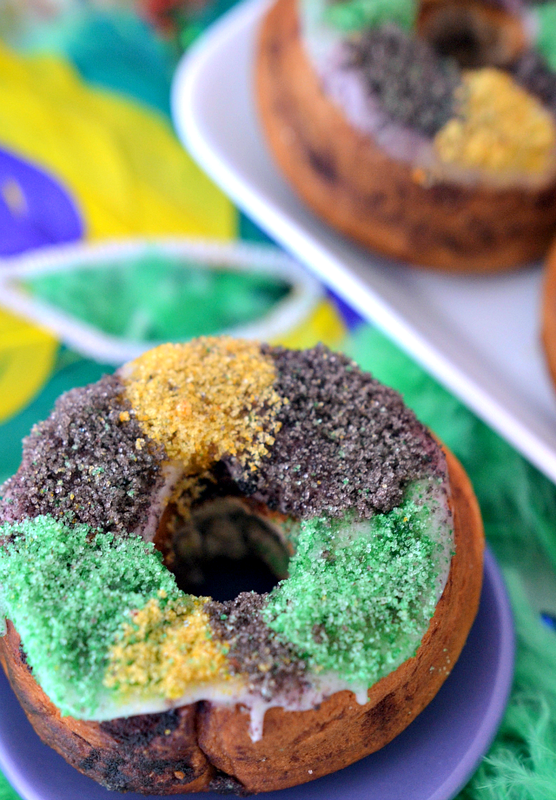 Set your mini king cake aside and continue the process with the remaining rolls.